Do you want a shot at winning A LOT of money? Then the time to play jackpot slots is now. Many online casinos have a section dedicated to jackpot Slots only. 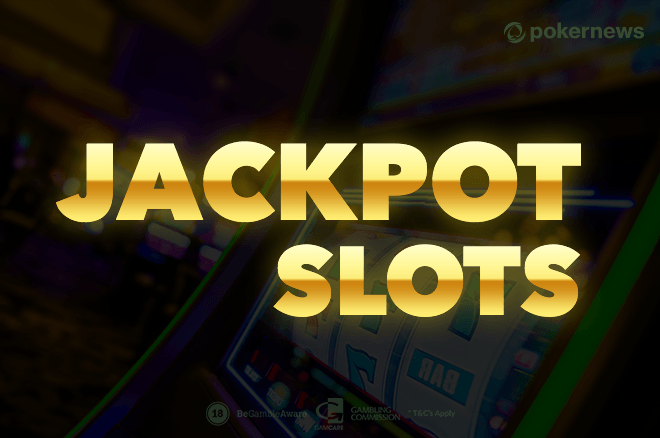 Contrary to the other Slots, jackpot Slots online pack not only frequent small-medium winnings but a spin that can bring you a fortune. It may sound as if I’m overreacting but I’m not. Last year a lucky winner won €4,600,000 on Mega Fortune jackpot Slot. Another one took away €2,200,000 at the beginning of this year. These are some big numbers. And it might take some time to hit them. But is it worth it? If we asked the above-mentioned winners, I’m sure they’d say it is. And I’m pretty sure you already know what you’d do with such amount of online jackpot wins. The main reason jackpot Slots are so tempting is the amount of money you can win. The usual Slot winnings can be a couple of cents or pounds. But online jackpot can start at £1,000 and go all the way up to £1,000,000 and more. Jackpot Giant Slot £9,252,786 Play now! Mega Fortune Jackpot Slot £3,700,133 Play now! DC Super Heroes Jackpot Slots £1,427,834 Play now! 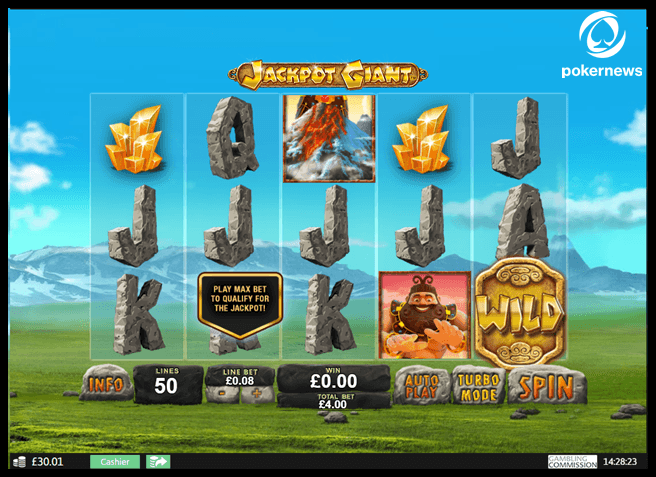 The biggest jackpot online currently is the Jackpot Giant. Reaching more than £9M, it can soon make someone very lucky. Playtech powers this game and its jackpot. And it's a name that never disappoints Slot players. The Slot has five reels and 50 active paylines. It has wilds, scatters, and a bonus feature. Since it isn't a very popular online jackpot, Jackpot Giant is won only every now and then. The last recorded win dates back to 2015, and it was £5M. Thus, the current jackpot is long overdue and can be won at any moment now! To win the jackpot you need to get five wilds on the first payline (full middle row). IMPORTANT: You can only qualify for the jackpot if you play for real money and make a max bet. This name is known for its thousands of players online. Mega Fortune is a progressive jackpot Slot developed by a top gambling software provider NetEnt. 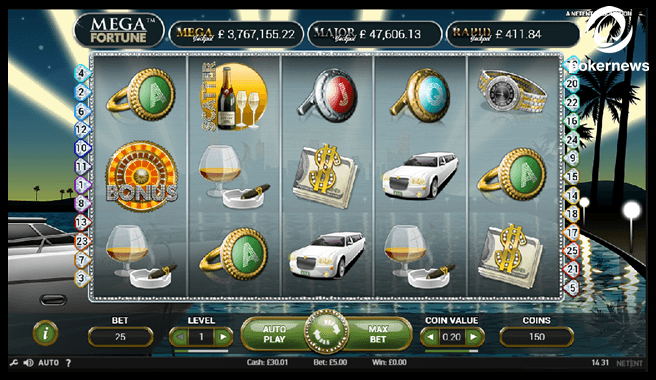 This jackpot Slot online is all about luxury and has not one but three jackpots – a rapid, major, and mega one. The rapid jackpot is the smallest one but like the name states, it gathers up fast and pays out frequently. It can be hundreds of pounds or a thousand or two. The major jackpot is a solid one, too, and can reach dozens of thousands of pounds. Whereas the Mega Jackpot is the one to keep your eyes open for if you’re reaching for the stars. It exceeds millions of pounds. The average win is over 4,000,000 while the biggest recorded jackpot reached 17,800,000 euros! The smaller jackpots vary from casino to casino. They’re pooled from players playing at a particular room. To have bigger ones, I’d advise playing at big well-known brands like BGO casino. More players mean more money in this case. The Mega Jackpot is pooled from all the casinos that offer the game. But it’s still essential to play at a trustworthy casino. The Mega Fortune jackpot Slot has five reels and 25 paylines. You win the jackpot once you trigger a bonus game and hit the Mega Jackpot symbol on the wheel of fortune. Playtech first blew away many other providers by making branded Slots. And then the rest of the competition by making branded Slots that featured a jackpot! This is where DC Super Heroes Jackpot comes to play. 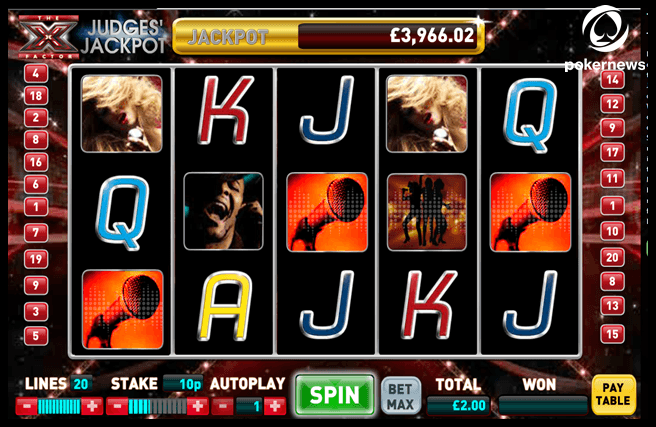 Playing any of the Slots in the series, you can trigger a million+ jackpot (currently around 1.5M pounds). Batman & Mr Freeze Fortune Play now! Batman & The Batgirl Bonanza Play now! Batman & The Catwoman Cash Play now! Batman & The Joker Jewels Play now! Batman & The Penguin Prize Play now! Batman & The Riddler Riches Play now! Superman The Movie Play now! As you can figure from the titles, all these Slots feature the superheroes we all love. Whichever you prefer – the choice is yours. And your choice won’t affect whether you win the jackpot or not. All the DC Super Heroes Jackpot Slots online have four levels of jackpots available. Mini, Minor, Major, and Grand, starting with €100, €1000, €10,000, and €200,000 accordingly. A jackpot is triggered randomly, on any spin. Apart from the three already mentioned jackpot Slots, there are a lot more to choose from. As jackpot Slots are still Slots, they need to have entertainment value, too. And why play luxury, superhero, or cartoon giant themed Slots if you hate those themes? Luckily, there are enough jackpot Slots online to choose from for any taste. 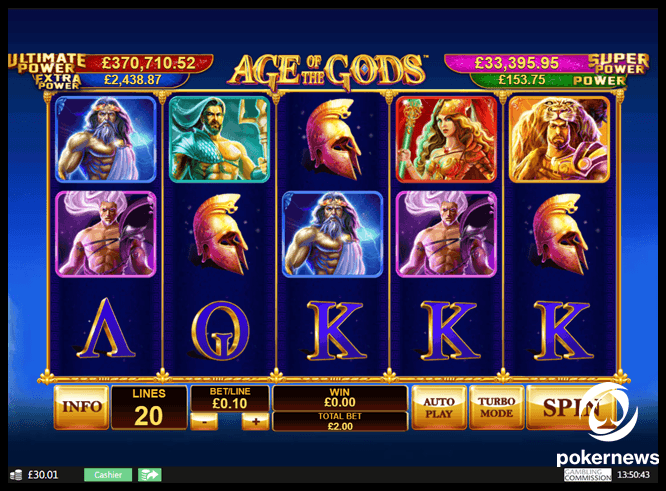 Mythical Age of Gods £361K Play now! 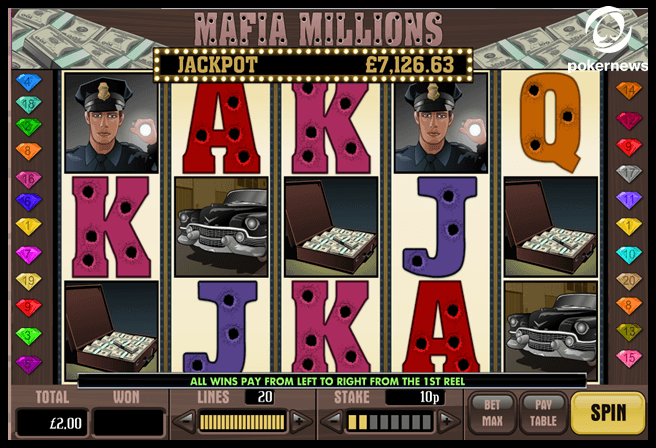 Action Mafia Millions £141K Play now! Fairytale The Glass Slipper £224K Play now! Fairytale Fairest of Them All £1,6M Play now! 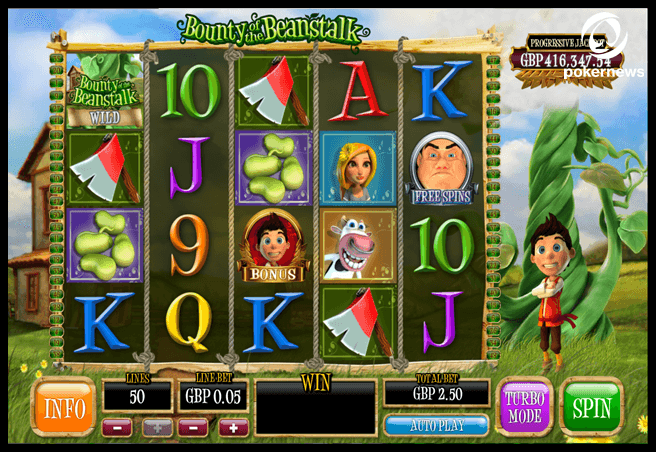 Fairytale Bounty of the Beanstalk £416K Play now! 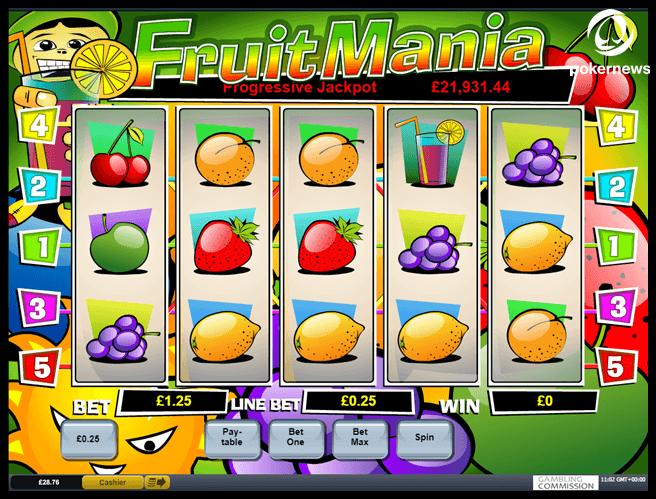 Classic Fruit Fruit Mania £21K Play now! Egypt Mega Jackpots: Cleopatra £614K Play now! Sport Frankie Dettori’s Magic Seven Jackpot £303K Play now! 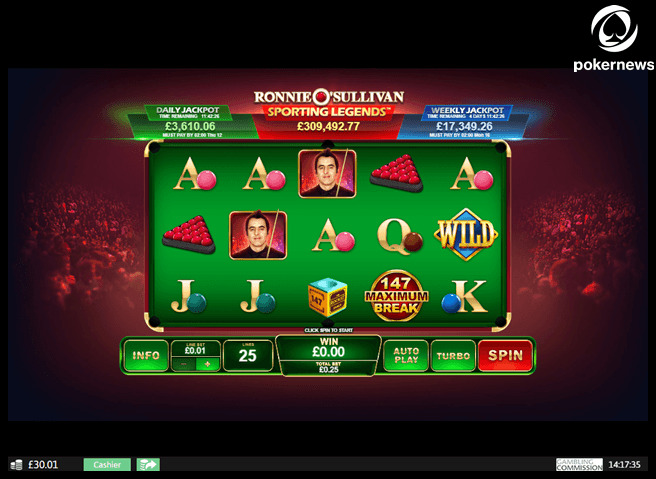 Sport Ronnie O’Sullivan Sporting Legends £307K Play now! TV Who Wants to Be a Millionaire £208K Play now! If you like mythical themes, you must play Jackpot Slots of Age of Gods series. Created by Playtech, these Slots feature our favorite ancient Greek gods and heroes. The Slots have four game modes and all the usual features – scatters, wilds, and multipliers. Its players praise the graphics and sounds. But these Slots wouldn’t be on this list if they didn’t have a jackpot. And they do. Four of them, to be exact. The biggest jackpot is called the Ultimate Power. It's usually worth around half a million and some lucky player hits it every six weeks. Currently, it’s around 400K pounds, so the winning spin is approaching. The jackpot covers all the Age of Gods Slots. Thus, you have a shot at winning it playing any Slot from the series. To increase the possibility of hitting the lucky spin, it’s advised to make higher bets. Max bets, if your bankroll allows it. Age of Gods Furious 4 Play now! Age of Gods Goddess of Wisdom Play now! Age of Gods Prince of Olympus Play now! Age of Gods Fate Sisters Play now! Age of Gods King of Olympus Play now! Age of Gods Ruler of the Sky Play now! Age of Gods God of Storms Play now! You can win a jackpot once you trigger the bonus game. Here you get 20 tiles on the screen and you need to choose three matching ones. No matter what you choose, you’re bound to win one of the four jackpots. I wish you get the biggest one! Nothing screams action more than mafia-themed Slots. Especially when they pack a progressive jackpot. Mafia Millions is just the thing. Play this Slot and witness the life of a mafia boss in this thrilling game. A player triggers the Mafia Millions jackpot once they land five Mafia Boss symbols on the betline. IMPORTANT: To qualify for the progressive jackpot, you need to make max bets (£2 per line). If your bets are lower, you can still win a percentage of the online jackpot. And, obviously, you need to play for real money. The jackpot is a part of the combined progressive jackpot together with some other jackpot Slots by Virtue Fusion. No matter our age, fairy tales always teach us a thing or two. When it comes to progressive jackpot Slots, it can teach you patience and determination to win. If you’re an adult but fairy tales are still your cup of tea, make sure to check out The Glass Slipper, Fairest of Them All, and Bounty of the Beanstalk jackpot Slots from Ash Gaming. The Glass Slipper Slot tells Cinderella's story. 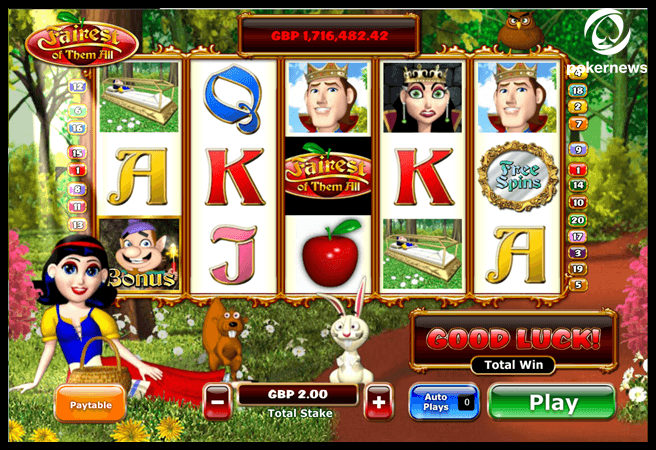 It’s often considered to be one of the best fairy tale-themed Slots ever. Gathering five of the Glass Slipper symbols on any payline awards you with the progressive jackpot. 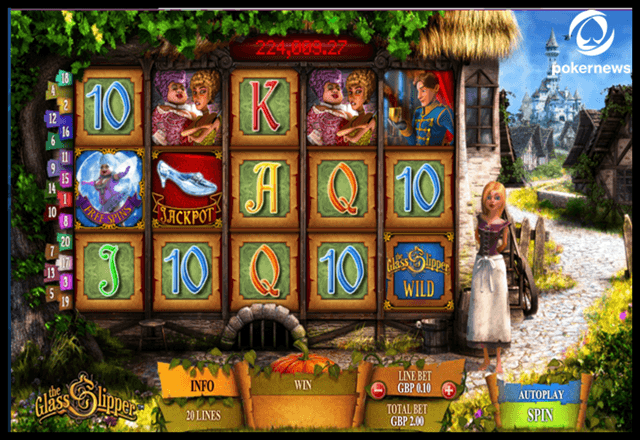 Fairest of Them All is another fairy tale-themed jackpot Slot. You’ll meet the Snow White, the Prince Charming, the Evil Queen, and get not one but three chances to win the jackpot. Prince Charming is the key. Land him on the reels, approach during the bonus game, or get him to appear on the magic mirror. One of the three appearances guarantees you a jackpot. Last but not least, Bounty of the Beanstalk. It's based on the Jack and The Beanstalk fairy tale. This Slot has five reels and four rows as well as all the classic bonus features – wilds, scatters, free spins, and a bonus round. How to win a jackpot? Land three bonus symbols on the reels 1, 3, and 5. And then collect three golden items – harp, goose and money bag - in the bonus round. If advanced themes are overwhelming, you can always go for the classic fruit Slots. Fruit Mania by Playtech is an example of such. This Slot is all about fruit. Cherries, lemons, blueberries, strawberries, oranges, grapes – you name it. This might be the smallest jackpot available on this list, but – hear me out- it’s paid out every four days on average! The Slot doesn’t have multipliers or a free spins feature but there’s a bonus game. The sun symbol triggers it once it shines on your fruit. And winning Fruit Mania’s jackpot is pretty straightforward. You only need to land five cherry symbols on the reels. Care for a trip to Ancient Egypt? 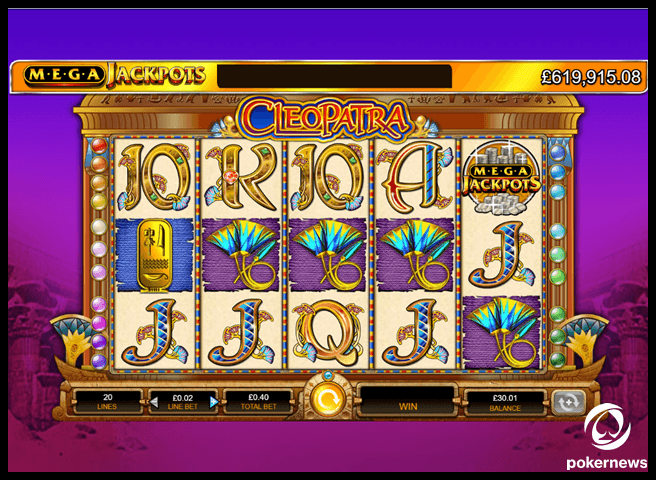 Mega Jackpots: Cleopatra is a progressive jackpot Slot from IGT. It has five reels and 20 paylines. Also, it’s a part of Mega Jackpots series and you can hit a big win playing any of the games from it. You win the jackpot once you land five Mega Jackpot symbols on the middle payline. To qualify for the win, you need to bet max. Egypt (and Cleopatra) is a pretty common theme among jackpot Slots. So, if you want to explore Ancient Egypt further, you can also try Cleopatra’s Chest, Pharaoh’s Treasure, or Queen of The Pyramids jackpot Slots. Sports fans can play what they love and win a jackpot, too! 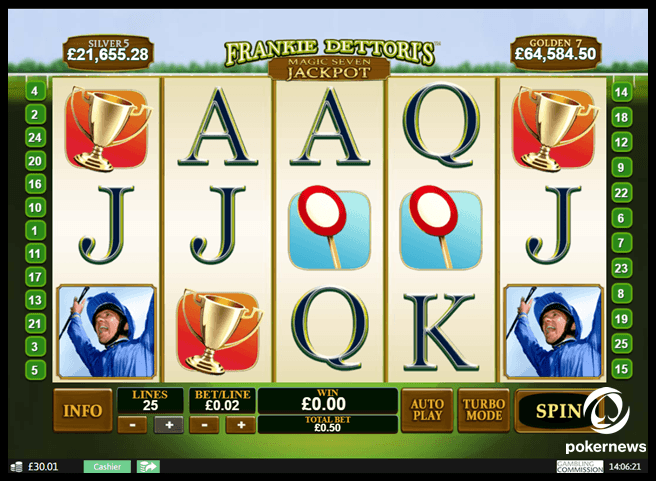 Frankie Dettori’s Magic Seven Jackpot is an example. This five-reel and 25-payline Slot was originally created as a non-jackpot one. But Playtech noticed its popularity and included a jackpot. The Slot dedicated to the Italian horse racing star can bring you a fortune. A player triggers the jackpot round randomly. You can win one of the two jackpots if you land five or seven trophies during the jackpot round. Ronnie O’Sullivan Sporting Legends is another Playtech jackpot Slot. I guess this makes the provider the king of online jackpots. At least on this list. This Slot has a snooker theme, five reels, and 25 paylines. Also, three jackpots – daily, weekly ones, and Sporting Legends progressive jackpot available through all the Slots in the series. You can trigger one of the jackpots at any spin! Less of a sports fan and more of a couch potato? Yes or no, you might like to play jackpot Slots based on TV shows. The X Factor Judges' Jackpot, for example. The Slot was also created by Playtech and based on a popular talent search TV show. Thus, it features the show’s famous X symbol. Get five Golden X symbols on a winning line and the jackpot is yours. If you bet max, that is. If not, you get only a percentage of the jackpot. Who Wants to Be a Millionaire is another TV show turned into a jackpot Slot. Created by Ash Gaming, it tries to recreate the original TV quiz show. Thus, once you land three Jackpot Ladder symbols, you enter a quiz round. Though, you cannot choose the answers as they're chosen for you randomly like anything else on the Slots. The more right answers you get, the higher you climb up the “Jackpot Ladder”. If you manage to reach the top – congrats, you get the jackpot. When searching for an online jackpot, you will come up with thousands of results. Are there that many jackpots available? Yes. Are they all equally worth it? No. How to choose the one for yourself? It depends on what you want. If it's a big win exceeding millions of pounds, go ahead and look for a progressive jackpot. It’s a type of jackpot that increases over time. Every spin on the game from every single player at any casino adds up to the final amount. Progressive jackpots vary in size at any given moment. For example, the seed amount can be £100,000 and it can increase dozens of times before someone wins the jackpot. Fixed jackpots are, well, fixed. The developer decides to have a jackpot of, let’s say, £250,000, and this sum remains. When someone wins it, it's still the same. There's no definite answer to which one is actually better. The possibility of winning a fixed jackpot might seem bigger as the progressive one might take a bit more time. But that’s not always the case. Because of the massive possible winnings, progressive jackpots are way more popular. So, even an impressive sum of £5,000,000 can be accumulated in just a few weeks. Gambling laws and regulations can be a pain in the a**. But they’re here for a reason. While some scammy casinos can promise you a jackpot of billions of pounds, there’s no guarantee they are willing to pay it out. Thus, you need to play at regulated casinos, to make sure you'll get your winnings. And while there are many such casinos online, you also need to make sure they are legal in your country. Read the terms and conditions, turn off your VPN, follow all the regulations and procedures, and be fair. If you want to cash out your winnings later, you have to play fair. If not, don’t blame the casino for not getting your winnings. They might not be able to do so because of the legal reasons you had chosen to ignore. As a rule, casinos won’t give you a shot at winning real money from a jackpot if you don't make a deposit. If you play on free mode, you may actually hit that lucky spin and win a jackpot. But there’s no way you will be able to withdraw it. The same goes for some of the bonuses. While some bonuses come with no strings attached like at bgo casino, it’s not the case everywhere. Many bonuses have wagering requirements or a cap for winnings. Imagine you win a jackpot of £4,000,000 but can only cash out £50. Avoid the stress, read the T&C before you press the spin button. Another important thing to know is the bet amount applicable for the jackpot winning. You can win some progressive jackpots only if you make max bets. That’s not a rule but a common requirement. So, check the jackpot Slot you want to play and figure out whether smaller wagers can bring you a jackpot. Also, many professional gamblers would tell you to always bet more. It gives you a better chance to trigger bigger wins, including the jackpot ones. All the above-mentioned jackpot Slots online reside at BGO casino. BGO casino is known to players in the UK and worldwide for its security, trust, newest high-quality games, and free spins that have no wagering requirements. It might be a little less known for its jackpots. And that’s a shame. BGO casino has 92 games with jackpots! Considering the fact that jackpot Slots are not the most common Slot machine species, that’s a lot. Plus, you can hit a jackpot not only while playing Slots but also blackjack, roulette, and video poker! So, how to start playing jackpot Slots at BGO? Make a deposit of £10 (or other currency equal) or more. Choose a jackpot Slot or another game from the BGO collection. DISCLAIMER. All the progressive jackpot amounts were checked during the writing process of this article and can change at any given time.